This weekend I’m back “outside” after winter, doing art in my parents covered terrace. Hurray for spring, approaching slowly but surely, how I adore thee! 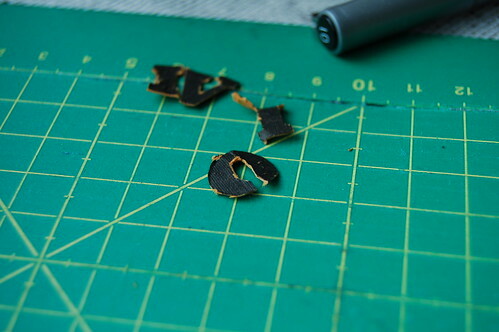 Finally some good light for taking photos while cutting out my first stencils. There happens to be just “a few” photos in this post, I hope you don’t mind. With this post I’m joining crusade no 19 called Cut it out II! The street team is all about cutting your own stencils in April. I’ve been drooling over stenciled pages in other artist’s journals for years not but not until the crusade called me did I decide to sit down and do it. And just as when I carved my first stamp this felt difficult. First my old xacto knife was dull. I got it 15 years ago from Mattons when I was studying to become a Window Shop Decorator (dekoratör) in Stockholm. I guess we cut out stuff back then? I don’t remember. Dad found me some spare blades in his workshop so I was lucky I could continue to cut out the letters I’d printed on card stock. But I didn’t cut any whole sentences. I didn’t enjoy it very much. 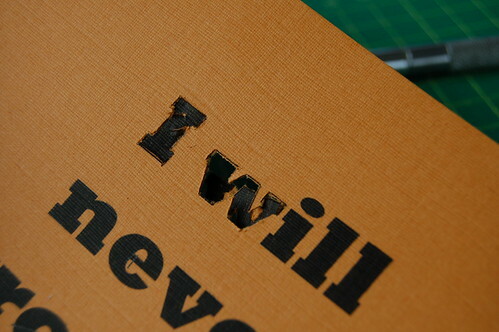 I cut out “I will” and the word “love” – then I got tired of cutting tiny words in the very idiotic font I used, at least for stencil cutting it was weird. Did you know there is a special font called stencil font? It’s a font that is designed to be easy to cut out and not make those “islands” that fall out! Want to download a stencil font? I found one on my laptop and there are even more fonts to download if you like the stencil style! Awesome! 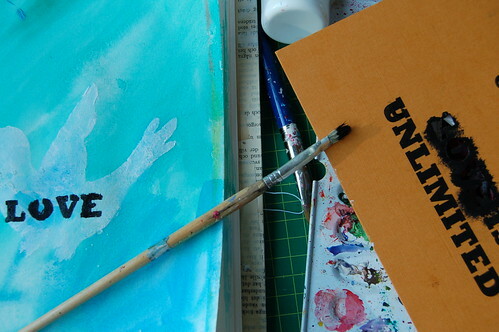 I drew a bird free hand on my card stock and cut that out instead, just as a test. Next I will cut out some different hears perhaps? 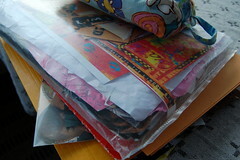 Or swirls if I can manage those! I love taking photos in the spring light we have on the terrace! You can also join the crusade if you feel like cutting out a stencil this month! I want to have another try at this for sure. Oh, by the way, did you see the banner I made for the Just be connected site? If you want a new banner I could make one for you too, for a small price. Contact me if you feel like letting spring into your blog header! This entry was posted in Art journaling and tagged art process, crusade, first try, stencils, the veranda. Bookmark the permalink. I’ve been peeking at the crusade site for awhile now maybe ill give the stenxils etc a go :) Love the pics! 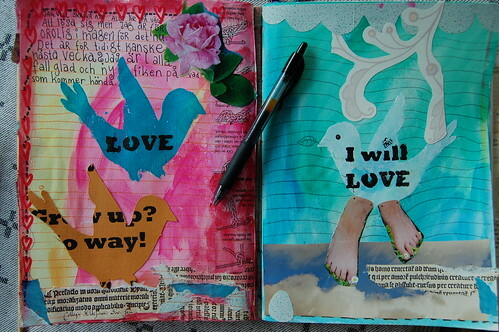 I love the pages you made with your stencils! The pictures look fantastic and the terrace sounds beautiful…no way I could ever carve with the knife..I can’t hold it steady without my fingers hurting! Look at you! You’re so meticulous! These are great and I look forward to trying mine. 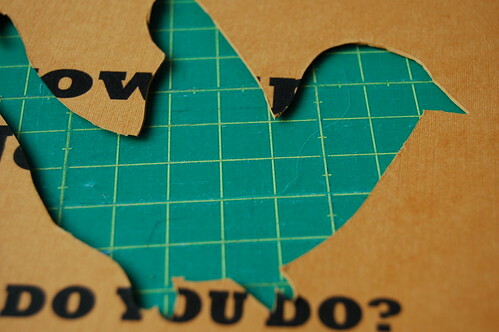 Hanna – thanks for sharing your stencil cutting experience. So happy you found a happy ending with the bird and a few of the words. I appreciate that you admitted cutting the words wasn’t so easy – good information for those who are just beginning. Great pages! Hannah these are great. I love the way you used them too. I know what you mean about wanting to cut out a way more advanced stencil as a beginner. I slaved away and made myself a little cuckoo doing my monogram with the curly cues BUT it is so worth it. 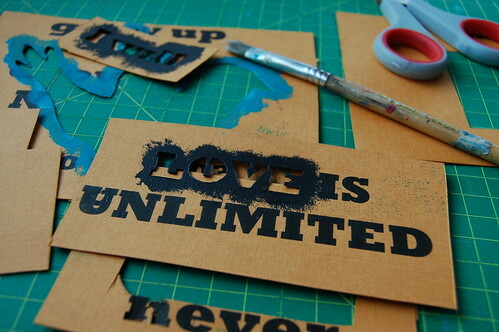 Anyway, I love your stencils, I think they are masterful and in no way look beginner! Just came across your blog and wanted to tell you that I love your photos, especially the ones at Grandma’s house and Hello Kitty. I love Hello Kitty! I gave up on stencils. I don’t have the patience. Love birds and yours are so cute – thanks for sharing. Hi Hanna. 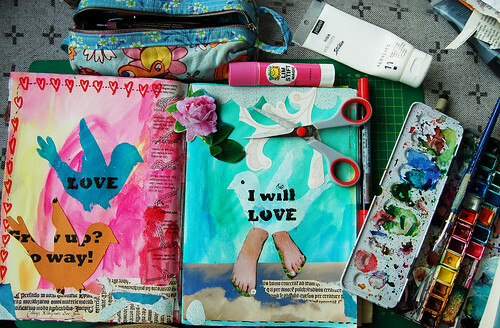 I love your journal page ! I love the feet on your bird ! So fun and springy. Sounds like you have an awesome place to play on a fine spring day ! This looks really great. Love it. Thanks for your comment on my stencils ! 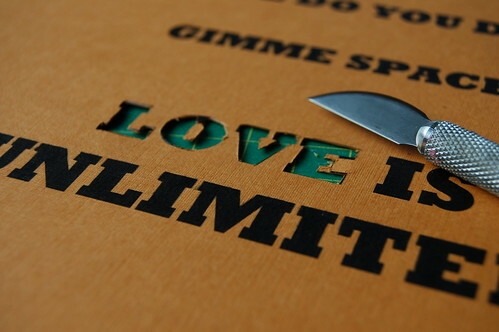 I used a stencil burner – it gives you more control when cutting the stencil and less pain in the fingers than a knife ! I haven’t tried words and bridges yet though – thanks for the tip about the stencil font ! Your pages are lovely and lively and the colors are delectable! I tried cutting out of cardboard with my Excacto “scalpel” and didn’t enjoy it, although the backgrounds I made for my bird stamps are useful. If I was smart, I’d stop here but n-o-o-o, I’m waiting for the half-off coupons so I can buy a stencil burner. Well, we’ve been warned! Ah, the slow journey back into sunshine – nice. I love that you say you see your new journal pages and they surprise you. That is so great. Hanna, well done on your words! I like the font you used and your pages are great! I used a knife through acetate and it was really easy as it was very thin! I love the bird, and I like the way you have flipped it over to use it facing both ways…. YAY! 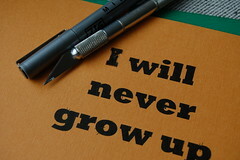 I will never grow up either. Thank goodness your Dad had some extra xacto blades! Thank you for sharing your stencil experience. I love that your journal pages feel so much like spring!